If you saw my most recent post, The Last Minute Frock, you might have seen the mustard belt that went with her dress. I made it in about 10 minutes. I just folded a 2 yard by 4.5" piece of knit fabric, sewed it lengthwise then turned it inside out and pressed with an iron. But you know what would have also looked good? A wide leather belt. They don't really make fashionable belts for kids. But I think one of these that Martha made would look great with that dress too! A good leather belt is usually somewhat expensive. 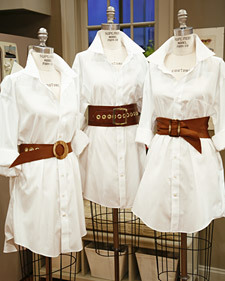 These fashionable leather belts achieve the look of a very expensive one -- for a fraction of the cost. A good Christmas gift would be the gift of one of these belts made by you. My favorite is the one to the right. CUTE! I really love your blog! Lovely post. I like it. Keep it up.